Julia Louis-Dreyfus is one of the most decorated artists of her time who is known for her casting in the sketch show Saturday Night Live. She has starred in many popular TV series, including Seinfeld, The New Adventures of Old Christine, and Veep. She has won many awards including eleven Emmy Awards and nine Screen Actors Guild Awards throughout her career. Julia Louis-Dreyfus was born on 13 January 1961, in New York City, New York, U.S.
She’s currently 58 years old. Her ethnicity is Ashkenazi Jewish, Mexican, German, French, English, Scots-Irish / Northern Irish and Scottish. Louis-Dreyfus graduated from Holton-Arms School, Bethesda in 1979. She then joined Northwestern University, Evanston to study theater but dropped out to pursue a career in acting. Julia Louis-Dreyfus married comedian Brad Hall in 1987. They have two sons together, Henry, born in 1992, and Charles, born in 1997. Julia Louis-Dreyfus made her acting debut with the 1986 dark comedy movie, Troll, in which she played the role of Jeanette Cooper. Louis-Dreyfus debuted in television with the comedy show, Saturday Night Live from 1982 to 1985, becoming the youngest female cast member in the history of the program at that time. 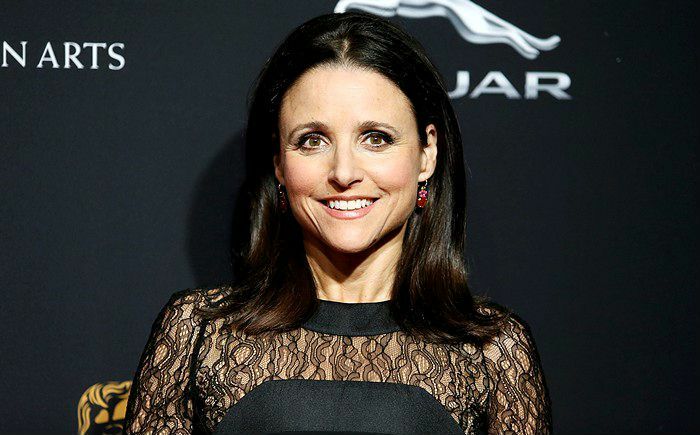 Louis-Dreyfus is known for her roles in the series Seinfeld, The New Adventures of Old Christine, and Veep. She has endorsed several brands and products including Yahoo, Old Navy, Google Chromecast, Clairol Nice-N-Easy, “Smith’s Crisp” potato chips, AT&T, Commerce Bank, Healthy Choice frozen foods. Julia Louis-Dreyfus net worth is estimated to be $200 million US dollars. She makes $150 thousand per episode. This money comes purely from her acting and endorsements and we haven’t taken into account the wealth that she’d apparently inherit from her father’s fortune. She has won Primetime Emmy Awards for Outstanding Lead Actress in Comedy Series for six consecutive years from 2012 to 2017 for her role as Selina Meyer in the TV comedy series Veep. In 2009 Louis-Dreyfus was awarded the honorary award for Legacy of Laughter at the TV Land Awards. In May 2010, she received her star on the prestigious Hollywood Walk of Fame at 6250 Hollywood Boulevard. She has lent her voice for characters in several animated films, including A Bug’s Life (1998) and Planes (2013). In 2016, She was included in Time magazine’s list of 100 Most Influential People in the World. Julia Louis-Dreyfus became the first actress to win Emmy Award for her work in three comedy series – Seinfeld, The New Adventures of Old Christine, and Veep. In 2014, she was inducted into the Television Academy Hall of Fame for her contributions in the television industry. In 2018 Kennedy Center honored her with the Mark Twain Prize for American Humor, America’s highest comedy honor.